Are You Drinking Too Much Water? Yes, It's Possible. Besides shriveling up like a raisin and, um, dying, you might already know what happens when you don't drink enough water. You get cranky, feel low-energy, and on and on. So you definitely need to stay hydrated. Chug, chug, chug! Actually, slow your guzzle: it is possible to overdo it. But how do you know when it's time to put the bottle down, aside from all the pee breaks? 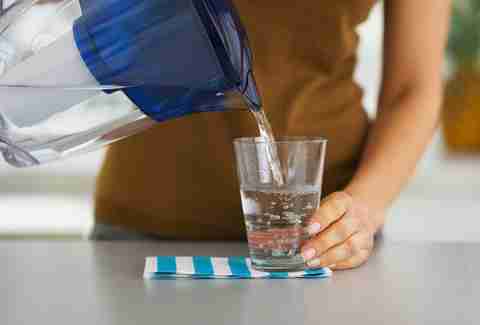 What are the signs of "water intoxication"? It's a real thing, for starters! And less fun than other varieties of intoxication -- too much H2O can be deadly. Overhydrating can lead to some nasty effects if you're not careful, and while early stages don't always have prominent symptoms, confusion, disorientation, headaches, nausea, and vomiting all can point to a problem. Longer-term symptoms can include muscle weakness, seizures, and even comas. Obviously these outcomes are rare, otherwise you'd hear constant warnings not to drink too much water. "You have to drink A LOT of water to get to this point, though," says Dr. Nicole Van Groningen. "Liters and liters over a short period of time. A normal kidney can excrete about half a liter an hour, at most. If you're drinking substantially more than this, you're putting yourself at risk for water intoxication." Hyponatremia is a condition in which the sodium level of the blood drops. Simple seventh-grade science class covered what happens when we add too much water to a mixture: you dilute it. Same thing happens when you over-imbibe water. "When you drink too much water, you dilute your blood and end up not having enough of your body's natural salt," says Dr. Lisa Ashe. "Eventually, if it drops too low, water rushes into cells," Dr. Van Groningen warns, adding that this can lead to swelling of brain cells, resulting in all those terrible aforementioned symptoms. This condition, somewhat ironically, can affect ultra-distance athletes who are so concerned about maintaining their hydration levels that they constantly drink water, dropping their sodium levels in the process. How much water do I need to hit the "just right" amount? The amount of water your body needs depends on a bunch of things from your size, workout, or activity level, to what you're eating. "The best way to avoid this condition is to sip," says Dr. Mark Sherwood. "When one is drinking 4 to 6oz of water spread out every 20-30 minutes during intense exercise, no issues should result. Absent intense exercise, there is really no reason to drink more than 6 to 8oz every hour." Dr. Sherwood says that a general rule for knowing what is enough water for your body is to "divide your ideal body weight in half and drink that many ounces of water." Others disagree. "It's hard to say how much is too much," cautions Dr. Ashe, who adheres to the age-old anthem of eight glasses per day. "There is no exact amount of water that everyone should drink daily. We (medical experts) have said eight glasses of water that are 8oz in the past because it's easy to remember." No matter what, experts say to learn you body as best you can, listen to its needs and wants. "One thing I wish more people knew was that our bodies are much smarter than we are," Dr. Van Groningen says. "Our bodies tell us when we need to drink water. If you want one rule about water, it's drink when you're thirsty. As long as you're young and healthy, your thirst mechanism will keep you well hydrated. There's not much more to it." Carson Quinn is an Indianapolis-based writer who barely remembers to drink enough water, so she's twisting a cap and raising a [water] glass to a hydrated summer! #chug. Follow her on Twitter @NewsCarson and Facebook.